Around 20% of people in Japan, Germany and Italy are aged 65 or over, making the populations of these three nations the world’s oldest. By the middle of this century 22% of North America’s population and just over a quarter (27%) of Europeans will be 65 or older, according to a report by the Pew Research Centre. What’s the problem with ageing populations? Countries need to find ways to pay for their growing older populations. Pew found that 41% of working-age Americans believe there will be no social security benefits left by the time they reach retirement. As workers grow older and move out of the workforce, younger people are meant to step in and contribute taxes to the programmes that support them. However, declining birth rates mean there are fewer young people to pay for the care of the elderly, and as the share of populations aged over 65 continues to grow the problem will only get worse. What about countries with young populations? Younger populations are usually considered an economic gift for countries. When the share of the working-age population (15 to 64) is larger than the non-working-age share there is usually a boost in economic productivity, a demographic dividend. In the second half of the 20th century, countries such as South Korea and Ireland benefited from demographic dividends. But a demographic dividend in the world’s youngest countries can turn into a demographic problem: a lack of jobs. 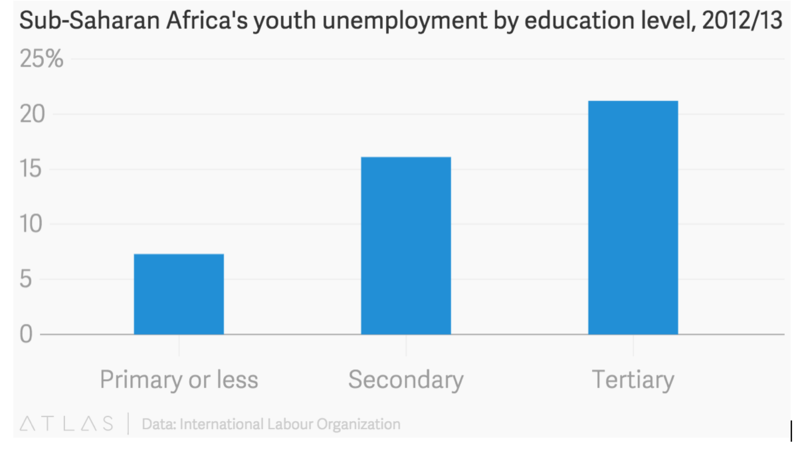 Sub-Saharan Africa is already one of the youngest regions in the world and youth unemployment is high. According to a report by African Economic Outlook between 2000-2007, the working-age population in Africa grew at 2.6% annually, creating 96 million working-age people, while only 63 million jobs were created. As older generations make way for young people in the workforce, there is increased competition over a limited number of jobs. 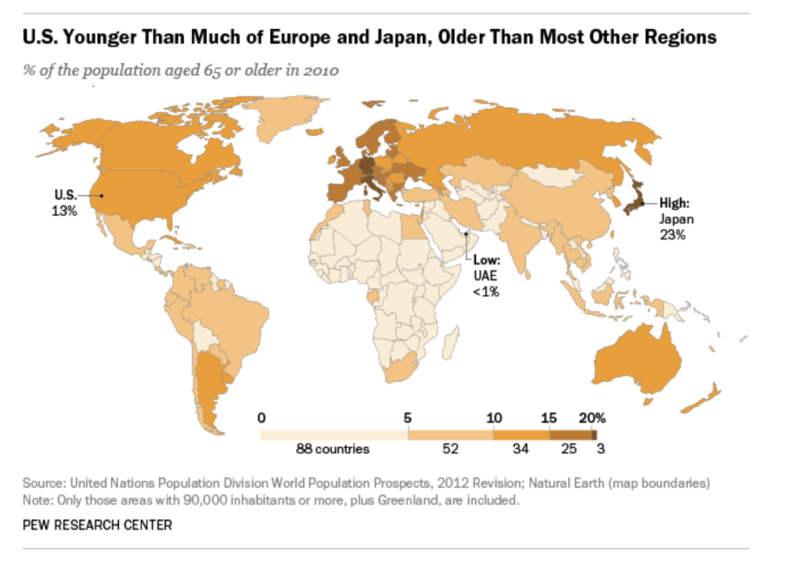 But even in countries with young populations, the proportion of older people is still growing. The proportion of over 65s in Africa is expected to double by 2050, according to the report. Currently the United States has a younger population than most European countries – only 13% of Americans are aged 65 or older. Demographically, the United Arab Emirates is the youngest country in in the world, with less than 1% of the population over 65. However, this is mostly due to a large immigrant population, with a government study in 2010 showing that less than 20% of the population have Emirati citizenship. Japan, on the other hand, is the oldest country in the world, with 23% of the population over 65. Have you read? 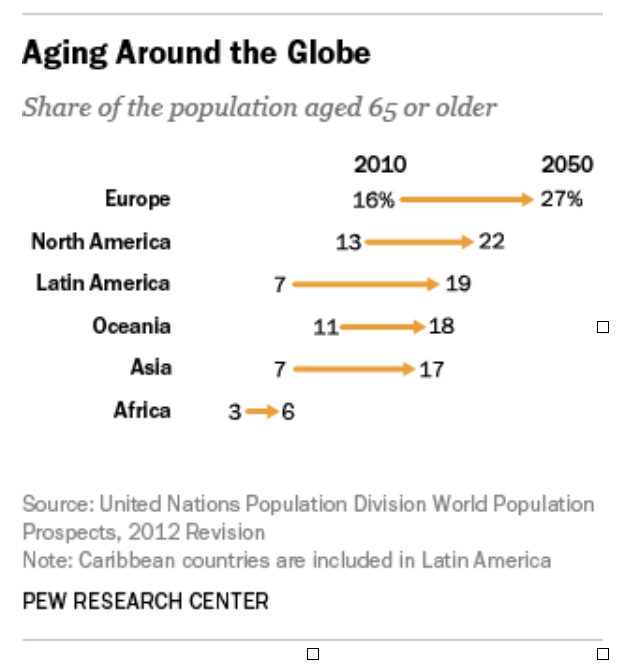 What are the economic implications of older populations? How wearing a robot suit could help us understand ageing Can refugees revive Europe's ageing population?